Bernie Sanders, the septuagenarian democratic socialist and junior senator from Vermont, is running for president again. And my, how things have changed. And my, how they’ve stayed the same. “Mr. Sanders’s bid is considered a long shot,” The New York Times wrote in 2015, after he entered the race that April. But when he announced he was running in 2019, after his challenge to Hillary Clinton had dragged deep into the primary calendar, the tenor was different: “He is among the best-known Democrats in a crowded field,” the Times wrote earlier this year. But even though he now faces much more competition than he did in 2016’s two-person race, Sanders is already outperforming his benchmarks from the last presidential election cycle. Now he is one of the frontrunners, not the insurgent. You can see that dynamic affecting several of the early indicators we’re tracking this primary season. The media, voters, donors and other politicians are all paying a bit more early attention to Sanders than they did last time around. 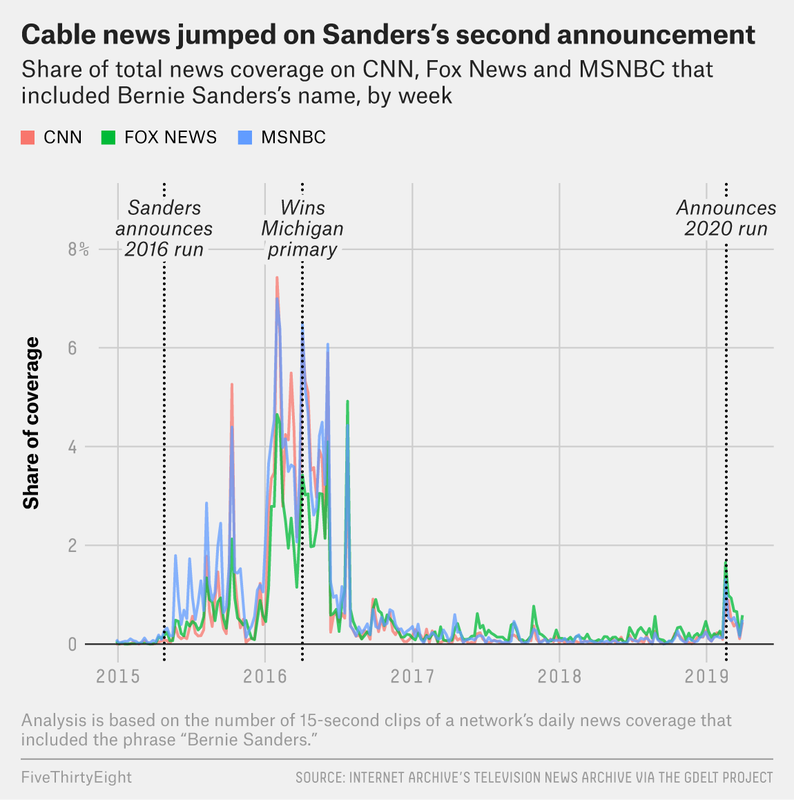 In April 2015, when Sanders announced he was seeking the Democratic nomination the first time around, the cable television networks — especially CNN and Fox News — paid relatively little attention.1 MSNBC was an exception, devoting airtime to Sanders even early on. In 2019, with Sanders now a much more widely known political quantity, the television response was swifter. Though he announced earlier in the primary season this time, CNN and Fox News have already given him a level of coverage that he didn’t get from them last time around until well into his 2016 campaign. Sanders’s media prevalence hasn’t yet reached the highs it did during the heat of his duel with Clinton in 2016, of course. But the media does seem to have responded more robustly to the beginning of his candidacy this year than four years ago — for whatever that’s worth. And in a caravan thick with Democratic candidates, it may be worth quite a lot. But let’s set aside the talking heads. What have prospective voters had to say? In 2015 and 2016, Sanders’s nationwide polling numbers rose more or less in lockstep with his media coverage, though it’s impossible to know to what extent one influenced the other. His polling support started out in the low single digits in the early days of the 2016 cycle, then steadily rose and later cracked 40 percent. That, though, was a different race. He was essentially only competing against Clinton, who was routinely polling at well above 60 and even 70 percent when Sanders first entered the race. But given the huge field this year, voter support is diluted, yet Sanders is near the top of the field already. He’s running a relatively close second to former Vice President Joe Biden in many recent polls and has led in others — and as of Wednesday afternoon, Sanders sits atop the field in at least one prediction market. Far from the long shot, he has entered the race as a top-tier candidate, and perhaps even as the front-runner. And the money to fund these campaigns? Early this month, Sanders’s campaign announced that it had raised more than $18 million in its first six weeks — a haul reaped from some 525,000 unique donors. According to a Federal Election Commission filing, the Bernie 2016 campaign took in a bit over $15 million in the first two months of that campaign. Again, the 2019 train appears to be ahead of the 2016 schedule. Another way we look at the strength of primary candidates is through who is endorsing them. Party elites use endorsements to influence both voters and each other, and the pace of endorsements can tell us something about what to expect from the primary season to come. 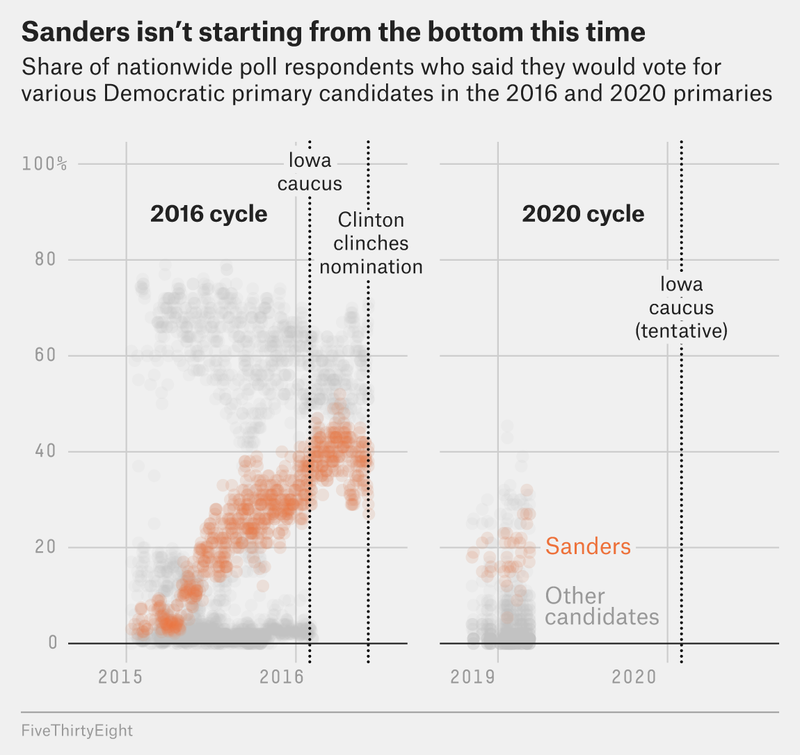 And here again, Sanders is off to a much faster start than he got in 2016. This cycle, Sanders has thus far earned nods from two representatives and a senator — the latter being Patrick Leahy, his fellow lawmaker from Vermont. Leahy, who supported Clinton in 2016, called Sanders “a proven leader with a strong message.” Four years ago, Sanders didn’t secure a single high-profile endorsement until more than five months after he launched his campaign. But our editor-in-chief Nate Silver wondered if, as Sheryl Crow suggested, some change would do Sanders good. It sometimes seems like Bernie thinks that if he just does everything pretty much the same as in 2016, this time he'll win. He certainly could win, but I think his chances would be higher if he looked at 2016 as something good to build on, but not a nomination-winning strategy. What a difference a few years make. And yet the more things change around him, the more Sanders himself stays the same. For the chart below, we used data from the TV News Archive, which measures coverage by splitting three channels’ daily news footage into 15-second clips and finding the share of those clips that contain a mention of our search term — in this case, “Bernie Sanders.” Further, we availed ourselves of the GDELT Television API, which processes the data from the TV News Archive. During the 2020 cycle, FiveThirtyEight has been tracking the endorsements from many more political actors than we tracked in 2016. Some potential endorsers we’ve added include former presidential nominees, big-city mayors and Democratic National Committee members, and Sanders has earned a few endorsements from people in those roles, including, for example, the mayor of San Juan, Puerto Rico.